In a serving bowl, combine garlic and salt to form a thick paste. Add the shallots, mustard, vinegar, and olive oil. Combine thoroughly. Add mushrooms and tomatoes. Let marinate. Add the parsley, oregano, tarragon, thyme, red basil, basil, chives, dill, and chervil. 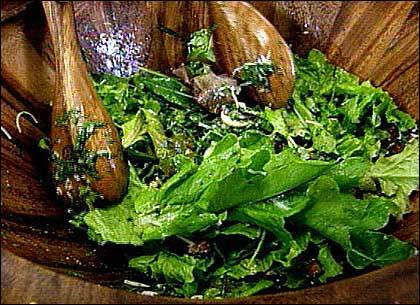 Toss salad with mixed lettuces and top with the cheese. This segment appears in show #3001.